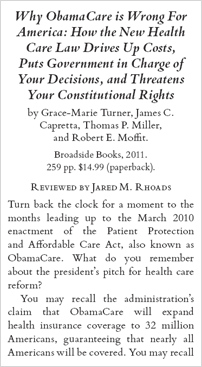 If you need a last minute gift for that health-care policy wonk on your Christmas list, you cannot go wrong with Why ObamaCare Is Wrong for America by Grace-Marie Turner, James C. Capretta, Thomas P. Miller, and Robert E. Moffit. The book is written in such a lucid, down-to-earth style that it makes an excellent gift even for the person who is only marginally interested in health care. Turner, Capretta, Miller, and Moffit were vigorous participants in the debate over Obamacare, and had the powers that be listened to them we wouldn’t be facing the burgeoning mess that we are. 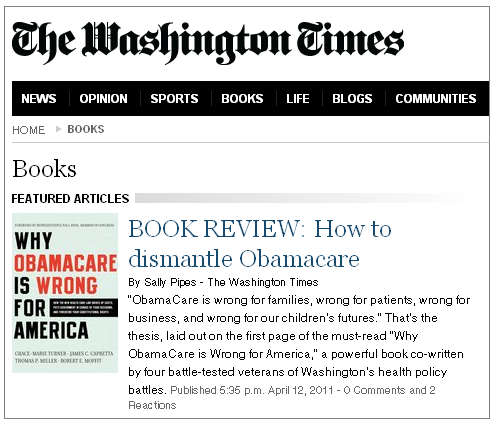 As Obamacare inevitably results in one disaster after another, having Why ObamaCare Is Wrong for America on your bookshelf will serve as an excellent reference for understanding why the disasters unfold the way they do. Not only did the book carefully explain and clearly predict the problems with the CLASS Act, but it reminded me what a tremendous resource this little paperback is for understanding Obamacare as a whole. Why ObamaCare is Wrong for America summarizes the key provisions of the new law, explaining how this historic piece of legislation fails to achieve the goals so loudly trumpeted by its proponents, and what it will actually do instead. The authors—four health policy experts from four different conservative public policy organizations—largely succeed in making a complex topic comprehensible to a general audience. For starters, they organize their analysis of the legislation into reader-friendly themes such as “Impact on Families and Young Adults,” “Impact on Seniors,” and “Impact on You and Your Employer.” The subsection headings are descriptive and frequent, dividing the chapters into easily digestible segments, many of which are less than a page in length. 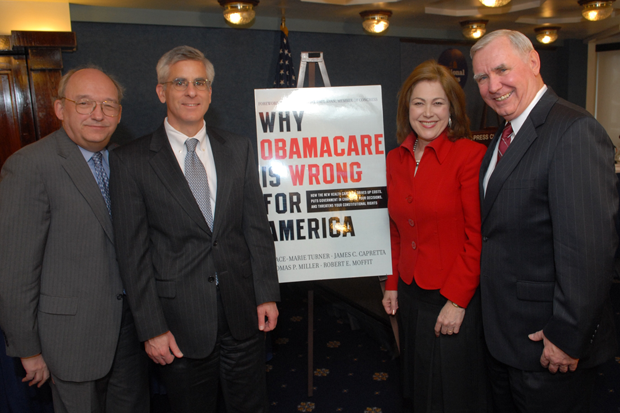 In the overview and the first chapter, “Impact on Families and Young Adults,” we learn that the architects of ObamaCare seek to achieve “universal coverage” not by means of market-based reforms—such as deregulating the insurance industry to open it up to interstate competition or equalizing the tax treatment of coverage purchased in the individual market—but by expanding coverage via two new federal entitlement programs: one to provide taxpayer-subsidized health insurance to low-income families and another to provide long-term health care benefits to seniors and people who are disabled (p. 21). The authors also explain that, in response to government changes in reimbursement rates, many physicians will limit the number of Medicare and Medicaid patients they see, drop out of the programs, or leave medicine altogether. All told, as many as 80 to 100 million people could see their coverage and/or their physician network change as a result of ObamaCare (p. 214). Similarly, say the authors, bright would-be medical students witnessing the deterioration in pay, job satisfaction, and professional autonomy in the field will opt for other careers (p. 108). These and other observations made by the authors clarify another major flaw in the “logic” of ObamaCare: Despite the president’s promise, patients cannot “keep” doctors who are no longer willing to practice, and medicine cannot thrive when the best and brightest flee the field. In general, the authors of Why ObamaCare is Wrong for America do a good job of condensing and critiquing the massive, detail-laden legislation. Although they approach the law head-on and are unabashedly critical, they refrain from hyperbole. For example, in the section titled bluntly “Are There Death Panels In ObamaCare?” (to which they answer “no”), the authors explain how the controversy arose and what protections are in place to prevent the emergence of death panels—and then acknowledge the legitimate basis for concern over this issue, which is the conflict of interest introduced when the federal government makes decisions about coverage while simultaneously trying to control program costs (p. 92).